Cookout enthusiasts like myself just can’t wait until the next grill comes on the market, so we can get our hands on one, fire it up and test it out. So when the Aussie 205 Stainless Steel Tabletop Gas Grill was released I did just that. This time I decided to share what I found so that customers might be better informed before they buy one. The measurements are 26.5 inches in length by 16.5 inches width and there is a 12.2 inch depth. Weight is 20.8 pounds and you don’t really want a grill to weigh any less than that, since this usually means it’s been produced with cheaper materials. I can’t argue with the workmanship of the Aussie 205; It’s a well put together, exceptionally designed grill made of stainless steel. The design isn’t very stylish, but the grills that are, usually lack substance, so while it may look minimalistic and simplistic, that’s just because it’s geared more towards great cooking, than fashion. Setting the Aussie 205 Stainless Steel Tabletop Gas Grill up, is really easy. All you do is take it out of the box, fold out the legs, light it, and your up and running. The only thing slightly difficult was that one must adjust the sparker for obtain ignition. Not a tough task though, and I was cooking meat in less than 5 minutes. The cooking surface is very large at 305 inches, which is more than enough for anyone, unless they have hundreds of people to cook for. Some grills pass the cooking surface test, but then when one starts to cook, they find the holes left for grease to drip off into the side tray, are not big enough. What you want from a grill is for it to efficiently drain all unwanted grease from the main cooking area, and also any burnt debris. Fortunately the Aussie 205 has both a large cooking surface and excellent drip off efficiency, so at the end, you’re left with just the beautiful meat. Temperature gauge is easy to see, and you can expect a heat of around 600 to 650 in about 4 minutes. This is by no means the quickest grill to reach cooking heat; some grills can have you sizzling sausages within 2 minutes, but 4 minutes is still pretty good. More importantly, the Aussie 205 heats the cooking surface evenly, and this is the single most important factor in producing consistently good cookout food. It’s not a very complex grill to perform cooking tasks on, and this is a double edged sword. Some people prefer grills with lots of different heat settings, and multiples gauges, but in my experience, the more complex a grill is, the worse it’s results. If a grill with lots of gadgets, and a futuristic design is your thing then this probably isn’t the grill for you. If you like to cook and taste great meat, my advice would be to buy the Aussie 205. It’s very simple, and extremely effective. 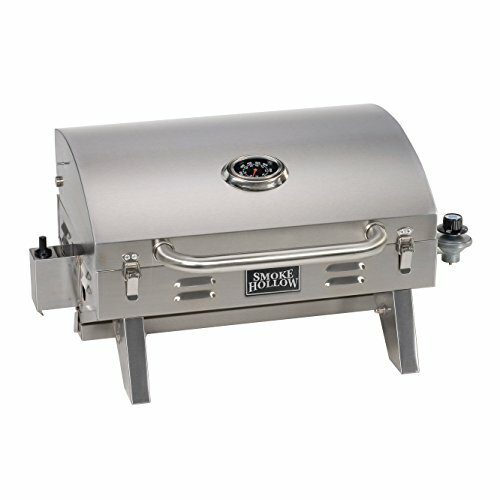 For the price it’s one the best grills on the market. It’ll cost you between $85 and $130 depending on where you shop and my results where perfect. The meat was cooked excellently on the evenly heated cooking surface and was grease free, due to the large drip-off holes. The lock works, so the Aussie 205, can be placed into a car and taken out for tailgating without flipping open and receiving damage. The stainless steel frame is sturdy and durable. I’ve seen grills at twice the price that don’t cook meat half as good. 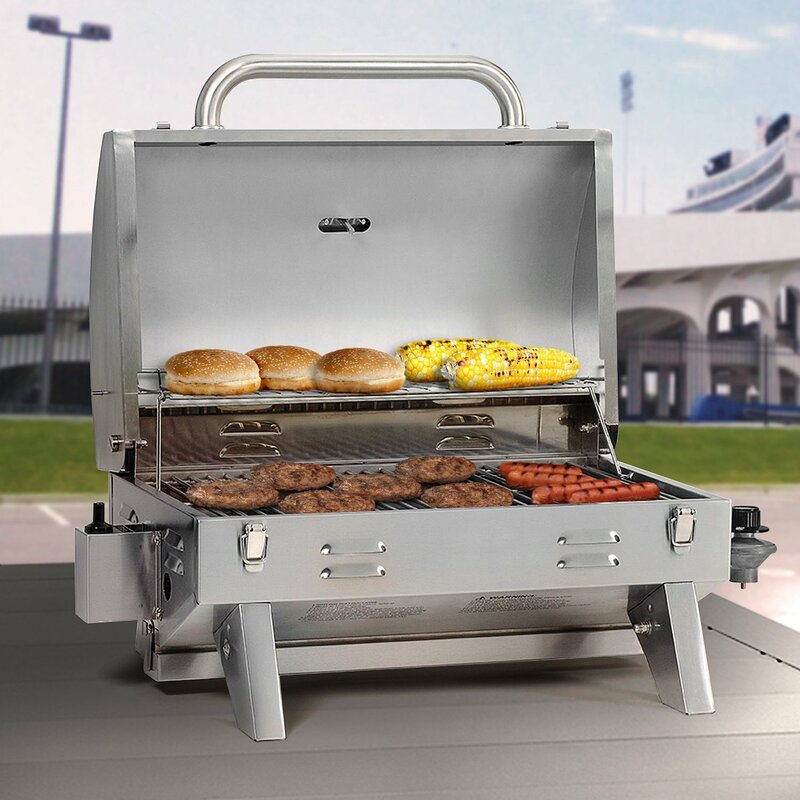 Definitely one of the best gas grills in the market right now.